After dozens of passenger train drivers call in sick, railway cancels dozens of trips. 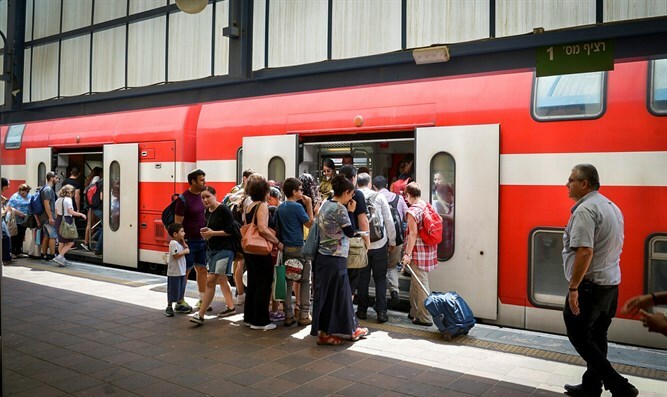 Israel Railways announced Monday the cancellation of dozens of trips on two lines: the Rishonim-Lod line and the Beit Shemesh-Malha line. On the first line of Lod, 21 trips will be canceled: 913, 914, 915, 916, 917, 918, 919, 920, 921, 922, 923, 924, 925, 926, 927, 928, 929, 930, 931, 932, 933. On the Beit Shemesh-Malcha line, 8 trips will be canceled: 567, 570, 571, 574, 575, 578, 579, 582. "Due to the malingering of passenger train drivers and the effective illegal strike of the railway [workers’] committee, there will be no choice but to cancel dozens of passenger trains, starting from the next hour, after 13 trains were canceled yesterday," Israel Railways said.